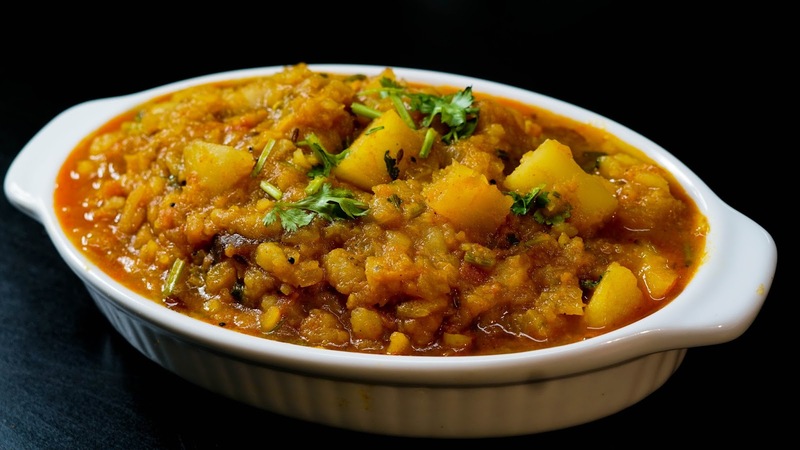 Potato Curry / Urulaikizhangu Kulambu is a simple Curry is a simple and easy recipe made with just few ingredients like potatoes and masalas. This recipe can be made in few minutes with ease. This recipe goes excellent with Chapati, Poori and Dosa. Step 1) heat oil in a pan and add mustard seeds, Once the seeds pops out add cumin and cinnamon stick. Add finely chopped onions , required salt and saute the onions for a couple of minutes. Step 2) Now lets add the masalas - Ginger garlic paste, turmeric powder, Garam masala, red chili powder , coriander powder, green chilies and curry leaves. Mix well and then add the tomato. I have used 1 large tomato for this recipe. Step 3) Add required water and let it cook for few minutes until the raw smell of the masalas is gone. Now add boiled poatoes and mash half of the potatoes with a masher or with a back of a tumbler and let it cook for few more minutes.Add water if required. Finally add coriander leaves for garnishing and turn off the heat. That's it our spicy potato gravy is ready to be served with Poori, Chapathi or with Dosa. Please do try this recipe at home and share your feedback. happy Cooking !! !.